This Nativity was hand-carved from pine wood by our friend in Egypt. This artisan is a Coptic Christian. 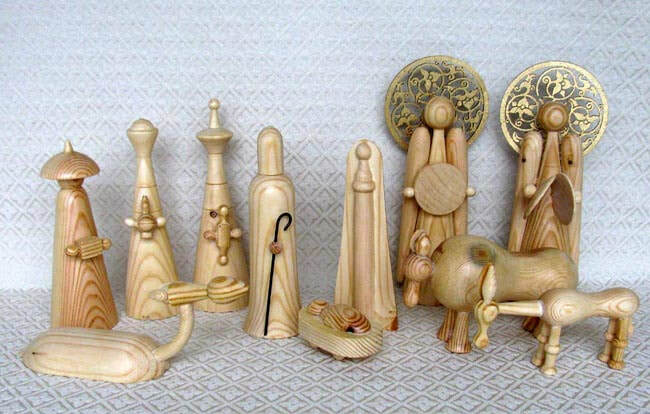 The unique abstract designs are created by turning each piece of wood on a lathe. The set includes Joseph, Mary, baby Jesus, a camel with long neck, a donkey, a sheep, three wise men, and two angels. The angels have carved wood halos. One angel plays a tambourine while the other plays cymbals. The angels measure 9 inches tall (to top of halo) while the Joseph figure measures 7.5 inches tall. $150. Please click here for purchasing instructions. ​Special order.